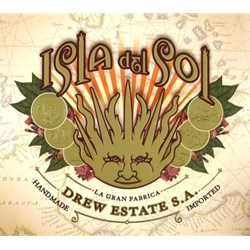 Isla del Sol is another great premium cigar line produced by Drew Estate. Individually crafted by hand from expert cigar rollers at the same factory as the world famous Acid brand, Isla del Sol are made for cigar connoisseurs who love and appreciate a well-constructed infused hand-rolled premium cigar. Each Isla del Sol is wrapped in a medium-dark brown “Sun Blessed” Sumatra leaf infused throughout with a triple Nicaraguan leaf mixture that delivers rich, flavorful and aromatic room notes. The Isla del Sol is a premium line cigar offered at an everyday smoker's price, affordable and available to be delivered right to your front doorstep. At Smokers Discounts we present the perfect way to unwind and relax each time you light up one of these handmade smoking gems. A variety of sizes and flavors are listed below in our online cigar store. Each of these styles are in stock and available today for a low discount price. Call us for more details!